I'm traveling through Europe and stopped in Berlin to see the Museum of Film and Television. Housed in a fabulous, modern, building it has interesting exhibits from the era of silent movies up to today. From the silent era, this clip from the horror movie The Cabinet of Dr. Caligari is so vivid and well done! I stood mesmerized as I watched it. I can see why it's a classic. They also have an entire exhibit of Marlene Dietrich's costumes from her movies as well as some famous public and private photos. The photo above is from her private collection. Just look at these two. 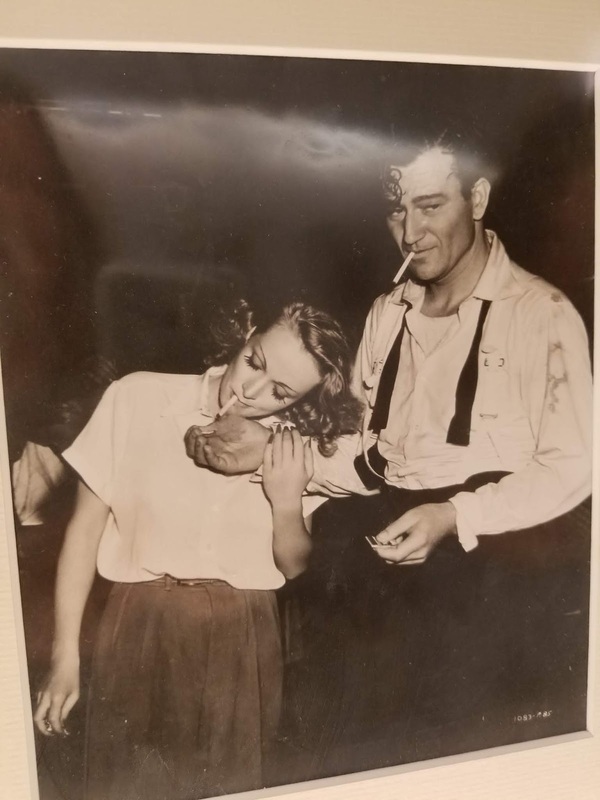 With Wayne's tie undone and Marlene reaching up to hold his hand still as he lights her cigarette, the photo is the epitome of cool. And Marlene was amazing. I'll admit I didn't know a whole lot about her before viewing this exhibit, but now I find her fascinating. She broke norms and apparently broke hearts if the passionate telegrams, postcards, and letters written to her are any indication. Seems as though everyone was drawn to her and more than a few fell in love with her. She must have been a larger than life personality. Dietrich was one of a kind, and so is Berlin. The energy and vibrancy is off the charts, but I had little sense of the decadence that must have existed before the war. Perhaps it's still there, simmering. I loved Berlin and can see why everyone I meet raves about the city. And from here I head to Rome, where the weather is warm and the people exuberant. One of my favorite places, I intend to hang out, visit the main attractions, and revisit a couple of streets that can be found in my next work in progress. I can't travel much lately, so I love items like this. Hope you're having fun. Yes, I'm having a blast as I work my way through Italy. Tomorrow-Pompeii! Glad you like the post! What a wonderful trip, Jamie. And a great report. Berlin continues to fascinate us, and for good reason. Thanks for a terrific post. Berlin is something else, isn't it? Such staggering (and sobering) history. Jamie, you are so right about Marlene Dietrich being an incredible and most "sought-after" actress - ah those were the days (and those were the great movies). Now that you are enjoying Berlin and going to Rome, I can only assume (hope) that you are gathering a lot of research and setting ideas for your next great thriller. Safe travels! She must have been "sought after." What a list of admirers. (Hemmingway, Fairbanks Jr., the list goes on).Thanks Karna! I'll have to put that on my list if I make it to Berlin! When you're in Rome, stop by my friend's restaurant up on Via Appia: Hostaria Antica Roma. Great place! Okay. Friday night is our last night here so I'll make a reservation. thanks for the tip! What a wonderful trip you're on. Have a great time. I was in Berlin with Addie two years ago in May and really enjoyed the city, too. My only regret is not going in 1975 when I was backpacking Europe with my BFF from high school. Then you could ride the train into West Berlin, traveling overnight on the train. The Wall was still in place... I can't remember where we decided to go instead, but I'm thinking we headed south. We were traveling in the area in late January, early February and it was cold. Southern Italy or Southern Spain was a much bigger draw. Oh hindsight! I never took that long train ride into the East either. Now one can only view a portion of the wall that was left intact and is covered with art. Still an affecting thing to see, though. After Berlin we headed to Rome and yes, the weather was beautiful!